If you are looking for a stylish, emotional, funny and modern Christmas Digital Card made in After Effects Christmas World is right for you! Christmas World is a joyful, colourful After Effects Template for Christmas. It includes 5 scenes, each with alpha channel and customizing options. You can change the colour of the background or even use the background scenery you want (use whatever image or tint you like), change the sentences, change the final logo and invert the order of scene number 2,3 and 4. 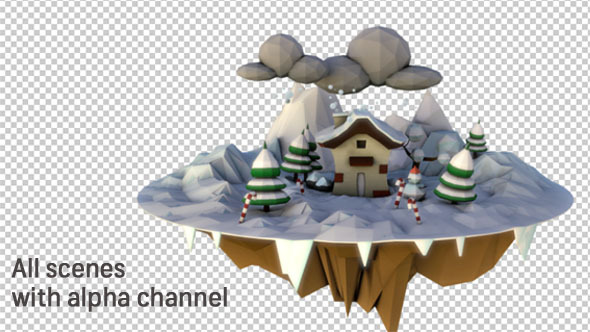 The Christmas AE Template you see in this page is made with the low poly technique. there is a winter setting, there are wrapped Christmas gifts, there is a nice and clumsy Father Christmas in red and white, there are deers and a sledge, there is a magical little town and a sparkling Christmas tree. Do you want a detailed description of the AE Template “Christmas World”, designed to celebrate your company holidays? In scene 1 there is a classic winter magical scenery, with a little cottage in the snow, candy canes and snowflakes coming down. In scene 2 Santa Claus is coming to town: he leaves from a icy pad with his reindeer sledge, taking the presents with him. In scene 3 Father Christmas gets off the sledge and opens his arms to make all presents fall on the ground. Here’s the Christmas tree for the presents to be arranged: in scene 4 you’ll see a Christmas tree with lighted and coloured Christmas balls and a final star festoon. In the last scene (number 5), there’s a snowman in a winter setting. Behind him there is a wooden bulletin board where you can write your greetings with your logo. In the background fireworks lighten the sky. Animation divided into pre-rendered highly detailed scenes with alpha channel.